I live in Glendale, Arizona and I don't usually go west of the Agua Fria River. When I do cross it, I see names of roads like El Mirage, Litchfield, Dysart, and many more. And I've always been curious about the names of roads in Phoenix. Most of the old roads in Phoenix led to farms, like the Bell farm, the Osborn farm, the Thomas farm, or the Broadway farm, so I was inclined to think that the road got its name like that. But then every once in a while there's a road like Sarival, which is a contraction of Salt River Valley, and I became suspicious again. This is what I found out today. Dysart was named after Nathaniel Dysart, a rancher who lived in the valley a looooonnnnggg time ago. 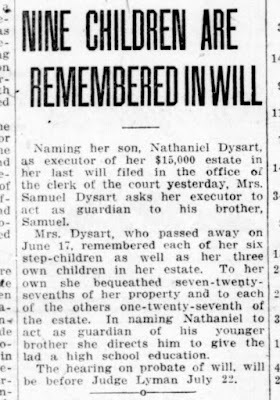 That's his picture up there, and here is a newspaper article from the Arizona Republican about his becoming executor of the will after his mother's death in 1918. He lived until 1957, donated the land for the Dysart School, and yep, Dysart Road is named after him. 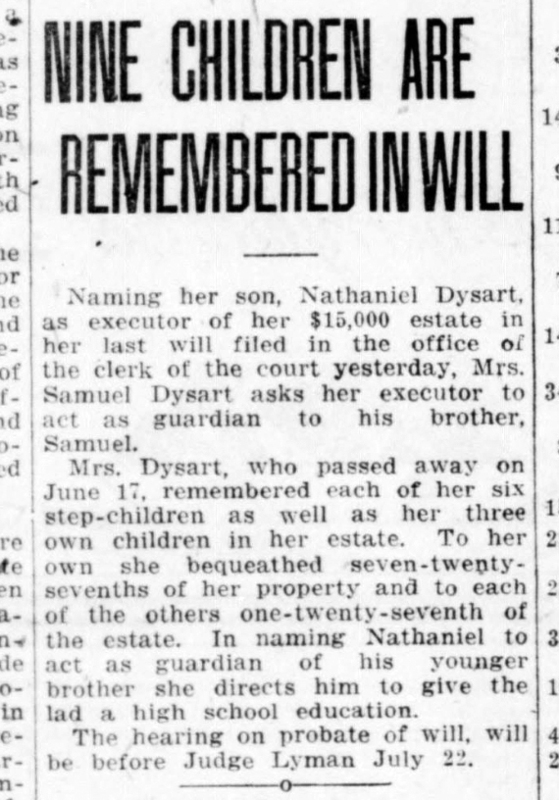 1918 article about Nathaniel Dysart. From the Library of Congress. I started becoming suspicious of names back when I was 19 and I decided to drive up to Snowflake, Arizona because I figured that I'd see a lot of snow there. Then I found out that it was named after two guys named Snow and Flake. Seriously. Google it if you don't believe me. And then I learned that the pleasant lake just north of me was named after Carl Pleasant. Can you see why I get suspicious of names? I really have no idea why I've always been so obsessed with names, and why I have always spent so much time in libraries trying to figure out stuff. Maybe it just makes me feel more comfortable with where I'm living, as if someone was going to walk up to me at any time, grab my lapels and demand to know who Dysart Road was named after. Of course, that's never happened, but it still makes me happy to find out. And it makes me happy to share it, because I know that there are people out there who care, and think it's kind'a cool, too.